Lee, Eun Sook. 2005 The Political Awakening of Korean Americans In Koreans in the Windy City: 100 Years of Korean Americans in the Chicago Area. Pp. 337-350. Hyock Chun, Kwang Chung Kim and Shin Kim, eds. New Haven, CT: East Rock Institute for the Centennial Publication Committee of Chicago. During the 1990's, Korean American civic participation reached unprecedented levels of activism and development. The Korean American community transitioned from their role as complacent observer to participant and stakeholder. From within their own diverse ranks, Korean Americans built a critical mass of politically engaged citizenry that organized around immigrant rights issues and succeeded in establishing a Korean American voice at the national level. The transformation of political agency within the Korean American community significantly impacted immigrant-related legislation, and furthermore, the political processes used by the Korean American community contributed to the development of new concepts on social change organizing that are relevant to the changing demographics and diversity of ethnic and immigrant communities in the American diaspora. By chronicling the success of Korean American organizing, this paper documents a rich and dynamic period of our immigration history in America. 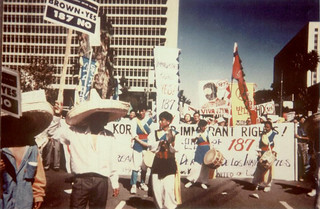 Key catalysts for the recent development of political identity and agency within the Korean American community were the 1992 Los Angeles Civil Unrest and the anti-immigrant wave of 1994. These events targeted Korean Americans' social, economic and political vulnerabilities and led to the tremendous education and organizing of Korean Americans on immigrant rights issues. Within a decade, Korean Americans mobilized with a strategic allocation of resources and by building capacity towards participation in the political and electoral process including voter education, registration, mobilization, research and rights advocacy. The politicization of the Korean American community, a 'coming of age', so to speak, is aptly reflected in the political maturation of the countless immigrant seniors. Senior citizens were the central protagonists in this journey from a state of vulnerability to one of empowerment, identity and agency. As the members of our community who were the most directly hurt by antiimmigrant policies, they provided clarity and urgency to the issue. Forced out of the necessity of basic survival, Korean seniors began to speak out; they have subsequently become the most informed and committed community members and organizers. With the engagement of Korean seniors, the Korean American civil rights movement has taken on a unique intergenerational dimension often absent in popular movements. In Chicago and in other cities across the nation, young Korean Americans, volunteers and staff at the Korean American Resource & Cultural Center (KRCC) worked side by side with Korean seniors--helping them write their stories to members of Congress, translating their words at testimonials, and walking side by side during marches. Together, the new and older generations of Korean American immigrants learned about the political process, leaving significant imprints in the American political landscape and reshaping popular perceptions of Korean Americans. I count myself as lucky to have been a part of this transformative process. I understand and define civic participation as "becoming involved in community affairs". To the 'average' American citizen (white, born in the U.S., and fluent in English), civic participation is tame, accessible and a given right. This term and form of action becomes more politically charged and injects new meaning in reference to those who are dis-empowered: those with less or no access to resources and opportunities; and minimal or no representation in social, economic and political life. Korean Americans are one of many communities that fit this profile. Vis-a-vis the average American citizen, civic participation is a fundamentally differently exercised, accessed, and understood right for Korean Americans. Korean Americans now number 1.07 million in the United States and 40,000 in greater Chicago, according to the 2000 Census. The figure is estimated to be considerably higher according to other sources. The Korean Foreign Trade Department, for example, counts 2.1 million nationally and 500,000 in the Midwest, the latter of which the greatest concentration resides in greater Chicago. Close to 75% are recent immigrants who immigrated after 1980, and an estimated 18% are undocumented. Approximately 50% are naturalized, and 78% speak limited English or no English. Although there are widespread beliefs that Korean Americans have succeeded economically, the vast majority of them still face social discrimination and limited employment opportunities, with pockets of the population living in poverty. To the extent that some Korean Americans have achieved some economic success, many suffer irreparable costs such as working 14 hours a day, 7 days a week; little or no communication with their children; and dismal health conditions. These data sum up the profile of the Korean American population and indicate the reasons and conditions for their dislocation from the political arena. Sadly, modem popular culture has furnished generally negative images of Korean Americans as self-centered, focused on economic success and educational achievements over social concerns or contributions to the building of healthy communities. I hold that of the Korean Americans who arrived after 1965,  regardless of whether they arrived as foreign students, visitors or legal permanent immigrants, few hoped to stay. Many talked about earning enough money to fund the higher education of their children and retire in relative comfort in Korea. But deeper or more influential than this desire for financial security or ensuring the academic success of their children, Korean Americans maintained a sense of being permanent immigrants who settled in the United States because of political and economic instabilities back home. (Korea's modem history includes Japanese colonialism (1905-1945), the division of Korea (1945), the Korean War (1950-1953) and in the case of South Korea, successive military dictatorships and police states.) Many Korean Americans sought temporary refuge in the United States, all the while nursing the dream of going back after the unification and/or democratization of South Korea. In the same way of a young country girl is forced to migrate to work in the city, Korean Americans left a poor, underdeveloped but beloved home country for the promise of a rich, developed nation. They left in sadness and encountered a world foreign in color, smell and touch. Regardless of the original and primary factors motivating their immigration across the Pacific, Korean Americans found themselves extending their stay for another year of study or work. They married, began to raise families and as the years passed, it became more difficult to imagine returning. At the same time, obstacles such as language barriers, lack of social contacts and unfamiliarity with the American political process prevented many Korean Americans from becoming more visibly and actively engaged in civic participation. Many immigrants may have hoped to live in quiet obscurity. Life disengaged; the body found itself in the United States while the heart and mind retreated to Korea. Two key events shaped and contributed to the civic participation of Korean Americans: the Los Angeles civil unrest of 1992, and the anti-immigrant wave of 1994. Beyond the financial, political and social devastation to the city of Los Angeles, this event had ripple effects in Korean American communities throughout the United States as well as in Korea and within the Korean diaspora. The Los Angeles civil unrest was the most significant event in modern Korean American history, pushing Korean Americans, young and old alike, and as a community, to realize their lack of political power. Attacks were lobbed from both sides. Korean Americans were not only scapegoated as immigrants who do not contribute, 'keep to themselves', and make no effort to assimilate; but they also did not have the influence or significance to warrant protection or political consideration. The Los Angeles civil unrest forced Korean Americans to rethink the role to which they had become consigned, and their level of responsibility in American society. Questions circulated in the Korean American community: Will we remain perceived temporary residents, cloistered in our so-called ethnic enclaves, planning for the day when we can return or retire to our cherished homeland? Or must we begin to participate in building community? The year 1992 demanded and showed Korean Americans that it would be not only irresponsible, but dangerous and politically volatile to remain in isolation. Organizational response to these realizations took place in the formation of the Korean American Resource & Cultural Center (KRCC) in Chicago and the National Korean American Service and Education Consortium (NAKASEC), as well as through the shifting of program and policy priorities of existing community organizations. Newly recognized community goals would include civic participation, the broke ring of political power, addressing questions of race and racism, and establishing a political identity. I refer to a Korean American phrase that was popularized through a song from 1994 which captures this transformation, "To Lay Our Roots on this Land". Shortly after the 1994 elections, the Republican-led Congress flooded the halls with anti-immigrant proposals. Immigrants were blamed and scapegoated for many social problems - from unemployment, crimes, and welfare, to the breakdown of the American social fabric. Proposals being flouted included the denial of Supplemental Security Income (SSI)  and food stamps to legal permanent residents, and possibly to naturalized citizens as well. Within the immigrant American community in the United States, there was a prevailing mood of instability, shock and fear. In particular, Korean American seniors were seeking support and solutions. Some contemplated suicide. These policy changes were being pursued in spite of the fact that as of 1990, a mere 1.1% of Korean Americans under 65 years received cash public assistance-the second lowest rate among Asian Pacific Americans. As for seniors, 44.2% of Korean Americans over the age of 65 years relied on public assistance. With regard to SSI alone, an estimated 24,000 Korean American seniors were recipients in 1996. The passage of any number of proposed bills would eliminate their ability to meet basic living needs and place them in a precarious economic situation. Many would become a financial burden to their children; few of whom could provide for extended family members. Moreover, seniors could not overcome the proposed new guidelines by simply naturalizing. Few are able to read, write or speak English well enough to pass the English and civic tests and given their age, the option of learning a new language is severely constrained. KRCC was officially founded in 1995, the year after the National Korean American Service & Education Consortium (NAKASEC) was formed in 1994. Both organizations shared a similar mission of presenting a progressive Korean American voice on critical civil rights issues. The purpose was grand. Given the political climate at the time, immigrant rights emerged organically as the centerpiece of our activity. In comparison to the existing Korean American organizations in Chicago, KRCC was distinctive because of its composition-most of the original founders were young (in their teens and late twenties), recent immigrants, had limited English skills, and were non-professionals without higher education degrees. Moreover, women were part of the leadership structure. In other words, KRCC and its founding board, staff and volunteers wielded minimal (if any) economic, social and political influence within the microcosm of Chicago's Korean American community. KRCC was also distinctive in its mission, philosophy and operating structure. We sought to link social services, education and culture with organizing and advocacy because we held that all components led to a holistic approach to improving the life of the individual and the community. Moreover, we believed and practiced a belief that social change must be global in its parameters. Today, KRCC is recognized as a breeding ground for young Korean American activism. A significant force in this development has been Young Koreans United (YKU), a national political membership organization formed in 1983. At the height of the pro-democracy movement in South Korea, an unparalleled level of activism issued forth throughout the Korean diaspora. In the United States, South Korean political asylees & foreign students, recent immigrants, and longtime religious and political Korean American activists were drawn together to present a progressive voice of dissent. As was the case throughout the nation prior to 1992, Korean American organizations in Chicago primarily provided social services and limited advocacy. Thus, when Korean Americans sought political leadership to address the anti-immigrant wave, existing Korean American organizations were not in a position to meet or failed to meet this level of need. Given community discomfort or skepticism about who was supporting or directing YKU, the organization decided to contribute significant resources, including the donation of volunteer full-time staff for the first few years, to support the formation of KRCC. In addition, YKU contextualized its political perspective and knowledge within the Korean immigrant experience, and provided comprehensive training and study sessions to KRCC volunteers on organizing models & methods, sociopolitical ideas & philosophy, and a critical re-evaluation of Korean and international history. The notion that action (activism) and thought are integrated parts of everyday life became infused through study sessions and was emphasized through practice. As well, the importance of instilling a personal, political and cultural identity in order to gain a sense of being and direction as Korean immigrants living in the United States was promoted. In time, while both organizations sustained a strong alliance of mutual respect and a common vision, it has become convenient and tactically effective for KRCC to focus on domestic issues while YKU focused on international and homeland issues. The first major campaign in which Korean Americans in Chicago participated was the advertising campaign co-initiated by NAKASEC and KRCC, entitled "Justice for Immigrants", in the summer of 1995. The original goal was to raise $25,000 from individuals and organizations for a full-page advertisement in the Washington Post opposing anti-immigrant legislation. The campaign addressed the urgent need by Korean Americans to understand welfare and immigration policies; to create links with diverse sectors and communities such as women, labor, and African Americans; to mobilize a united voice in support of immigrant rights; and to advocate for legislative changes. In doing so, we also asserted our identity as immigrant Americans. The Washington Post was tactically selected because at $25,000, it was half the price of an advertisement in the New York Times. The Post was also favored by reasons of its readership, which includes members of Congress and national policymakers. Within six weeks, we had surpassed our goal, raising over $55,000, from 300 organizations and thousands of individuals. With the exclusion of a handful of organizations that pledged $1,000 towards the campaign, the remaining $5 ,000 was raised from the grassroots, with each individual contributing an average of one dollar. In the case of Chicago, beyond the success of raising $10,000 and securing endorsements from 96 local organizations, the campaign led to the coming together of diverse immigrant communities and fostered their collective foray into the legislative and policy arena. When the campaign proposal was first introduced, mainstream immigrant rights policy organizations in Chicago were discouraging, became territorial and expressed their skepticism on whether the campaign would lead to concrete policy changes. As a result, they did not participate or contribute resources until much later in the campaign. Yet, local community-based immigrant organizations were not only curious about the novel approach; they saw the campaign as timely and relevant. They knew that an anti-immigrant mood was brewing across America. As in the Korean American community, seniors were fearful of losing benefits, young people were fearful of losing eligibility for student loans, pregnant women were fearful of being denied medical services, and all were fearful of becoming the targets of discrimination and hate crimes. The press conference to launch the campaign was held at Erie Neighborhood House, and included representatives from the Polish American, Chinese American, Latino, Korean and women's communities. Presentations were made in five languages, and ethnic media generated broad media coverage. Subsequently, various activities were undertaken. ESL instructors in the La' 0 community held classes on the bills and took up collections from their s dents. The local Polish newspaper ran two full-page advertisements about the campaign, leading to checks of $5, $10 and $15 from Polish immigrants arriving at the doors of KRCC. Reporters from the Polish Daily News took up their own collection and made a donation. And in the Korean American community, young volunteers set up information tables in front of local supermarkets and visited local churches and temples, calling for Korean American community support, providing a sense of hope for a solution to the anti-immigrant attacks. Funds raised went to the placement of two full-page advertisements, one in July and one in September of 1994. The ads were widely circulated during a national lobby day effort organized by the National Immigration Forum, as well as at a range of local legislative visits. The momentum created from the ad campaign led to a range of activities during a two-year period from the time these bills were first introduced until the actual signing of the welfare reform bill in 1996. It was a period when Korean Americans, including KRCC staff & volunteers, seniors and the media learned first-hand about the legislative process and began to build a unified political voice. Each time a bill was introduced, passed through a committee, passed a full floor vote or arrived at the President's desk, Korean Americans carried out a variety of actions, including petitions, letters, rallies, marches, protests, workshops, and community forums. Limited phone calls were also made. Volunteers at KRCC can recount many late nights during the breezeless Chicago summer heat, and before the introduction of internet technology, when an assortment of fax machines were hooked up to separate telephone jacks in order to fax hundreds of letters which had been collected earlier that day. We had gone through two successful vetoes, before President Clinton announced on July 1996 that he would sign the third and latest version of the bill that Congress had passed. Korean Americans and immigrant communities around the country felt a measure of disappointment and deflation. Yet, we had also come very far since 1994. The bill would become law, but we would remind the White House and Congress of our opposition to its contents and our resolve to continue the pressure. Given that it was now less than four months before the 1996 presidential elections, the Korean American community made the strategic decision to mount a campaign targeted at the political parties, most significantly the incumbent Democratic National Committee (DNC). In late July, KRCC co-initiated a national letter writing drive with NAKASEC opposing the impending signing of the welfare reform bill. Knowing that the bill would be signed in a few weeks, we set our goal at 10,000 letters in two weeks. Eventually, 17,000 letters were collected from the Korean American community including 200 from seniors in Alaska, and notably 5,000 from Chicago. These letters were hand-delivered to the Asian Pacific American Outreach offices of the DNC. Korean American media ensured national coverage for the Korean American community. Separately, it was determined that the Republican National Committee (RNC), as the primary authors and instigators of the anti-immigrant wave, should be the subject of mass protests. Korean Americans joined thousands of others in rallies during the RNC Convention in San Diego. Simultaneously, KRCC held a protest in front of the RNC offices in Chicago and presented an open letter against the party's anti-immigrant position, endorsed by a broad array of local immigrant organizations. On August 21, the day before President Clinton signed the welfare reform bill, the Chicago office of NAKASEC (housed within KRCC at the time) received a phone call from Donna Shalala, then U.S. Secretary of Health and Human Services. Shalala had heard about the 17,000 letters and she pledged to do whatever possible to address the bill's unfair immigrant provisions, after it was signed into law. She asked us to relay this message to the Korean American community. For the first time, through this unsolicited phone call, we knew that the Korean American community had been heard. The unexpected outcome affirmed that we had taken the right strategy. In preparation for the 1996 federal elections, KRCC launched, for the first time, a multi-faceted campaign to promote voter registration, education and mobilization. This was the first campaign of its kind in Korean American history. In late September, KRCC supported the production, funding and distribution of the Korean language voter guide, titled A Guide to the 1996 Elections. This comprehensive guide provided a political context to the presidential elections, a directory of voter resources and services, hands on information on voter registration and the electoral process, and traced how voting rights had been achieved. Fifty thousand copies were distributed nationally, primarily through the support of the Korea Times, the largest Korean language daily. Ten thousand copies were distributed specifically in greater Chicago. KRCC volunteers conducted voter registration drives, held "How to Vote" seminars, and participated in phone banking. On Election Day, KRCC maintained a Korean language voter assistance hotline. 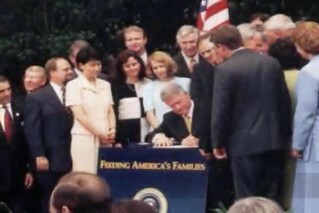 Following the re-election of Bill Clinton to a second term as president in November 1996, the Korean American community was intent on reminding the Clinton administration of his campaign pledge to rescind the discriminatory and unfair immigrant provisions of the welfare reform law. The following month, KRCC joined NAKASEC and Korean American organizations around the nation in the National Telegram Campaign to Restore Immigrant Benefits. The campaign's goal was to send a minimum of 2,000 individual telegrams to President Clinton on inauguration day, urging him to honor his campaign promise to immigrant Americans. Telegrams were selected as the form of communication because they lent an air of urgency, the messages could be coordinated to be sent on the same day, and it was a different and new tactic. Yet, because it was the holiday season, time consuming to fill out the paperwork per telegram order, and the higher cost of sending individual telegrams, the goal was set at 2,000. To encourage national, multi-ethnic participation, campaign materials were produced for the first time in four languages (Korean, Chinese, Spanish and English.) Once again, KRCC went out to the community. On Inauguration Day, January 19, 1997, a total of 2,600 telegrams, including 330 from Chicago, were sent. The subsequent restoration of SSI to certain groups of immigrants that same year truly reverberated the POWER of civic participation. It capped what was becoming a politically transformative experience. For what each member lacked in experience, language ability or economic influence; and what a community lacked in numbers or influence, it held more through the building of a unified political voice and voting bloc. And few wanted to stay quiet after this legislative victory. The seniors in particular were asking what other parts of welfare reform could be changed. I will merely highlight below subsequent campaigns to outline the increasing level and depth of civic participation within the Korean American community. In January 1998, KRCC participated in the national campaign to restore food stamps with the objective of sending thousands of paper plates with the message: "Our plates are empty," to members of Congress. Although a lower percentage of Korean seniors would benefit from this effort personally, the seniors took the initiative to go out to their friends and family and gathered hundreds of signatures. Ministers urged their congregation to sign the paper plates at the end of their sermons and individual Korean Americans were noticeably more receptive and informed at the markets. Later that same summer, when food stamps were restored to certain groups of immigrants, NAKASEC was one of four immigrant rights advocacy groups invited by the White House to attend the bill signing ceremony at the Rose Garden. When the national Fix '96 campaign was launched in 1999 by both national and regional immigrant rights coalitions, KRCC and its co-affiliates approached a new level of civic participation." More than 130 low-income Korean immigrant seniors were organized from six states for the national Fix '96 lobby day and rally. The seniors made legislative visits to members of Congress and held a special meeting with the executive director of the White House Initiative on Asian Americans and Pacific Islanders. Through interpreters, they spoke informatively and passionately about the harsh impact of welfare reform. And, they had the opportunity to develop fellowship and share stories with seniors from across the country. As a witness and participant to this event, I have been told, on many occasions, that the scene of hundreds of determined Korean seniors striding down the halls of Congress left an indelible and unforgettable imprint on Washington policyrnakers and elected officials. It was an event that many organizations have since sought to model and follow with their respective communities. The year 2000 was a time of optimism and promise. It had been six years since the Korean American community first began to understand and respond to the anti-immigrant wave. We felt that the tide was turning and that we could begin to move from reacting and defending immigrant rights, towards proactively advancing an immigrant rights agenda. Moreover our strategy and tactics could reflect the depth of our experience and knowledge. It was a time that allowed for the launching of the Full Participation of Immigrants Campaign, a long-term campaign which presented far reaching, bold, yet attainable goals; legalization of undocumented immigrants, restoration of 245(i) and the repeal of employer sanctions. These goals were framed around the concept that immigrants contribute greatly to bettering American society, and they must become essential players in furthering representative democracy. To launch the campaign and to demonstrate wide community support, we collected 30,000 letters (fifteen thousand each to the DNC and RNC), calling for the incorporation of the campaign's three goals in their party platforms. In May of that year, personal presentations and meetings were held with representatives from the RNC and Joe Andrews, chair of the DNC. While we continued to participate in other activities such as rallies and forums, this letter writing drive is an instructive example of the Korean American community's growing sophistication in seeking to shape the debate from the beginning, an not simply respond to party positions as they are presented. In the en , although there were few identifiable changes to the final RNC platform, Democratic presidential candidate AI Gore did publicly announce his support for the legalization of immigrants during his campaign. It was an important moment in time. We were essentially neophytes, spurred by the sense of justice and fairness, and were held together by the community support behind us. We exuded freshness and failed to see the barriers or limits, choosing always to take the plunge. I describe this mood based on memory, but it cannot be replicated today. Much of what we do nor does not feel "new" or like "the first time" that these actions are being taken. Conversely, the Korean American community has benefited from its own evolution. As stated in the introduction, we have transitioned from an individual sensibility and a place of powerlessness to an understanding of "community responsibility" and toward embracing a broader role as agents of social change. Through the activities of organizations such as KRCC and NAKASEC, we have also debunked the image of Korean Americans as complacent and conservative. Korean Americans hold diverse political viewpoints, including many who believe strongly in participatory democracy. And when there is case of injustice, the community, young and old, the first and second generations can all come together towards a common goal. What are the defining elements of the Korean American activist movement today? I characterize it as intergenerational, predisposed to cross-cultural coaliition building, multi-lingual, media savvy, grassroots-based, national in scope, and most importantly, able to carry out sophisticated campaign tactics and actions that can sway political forces and capture the imagination of the community. Just as important, however is that while this movement is new, it was immediately successful, and this success influenced the optimism of the movement. There were certainly obstacles facing us; the two most notable being, our lack of numbers and influence. We numbered less than 1 million dispersed through the United States, and few had social, economic or political power. Yet, we sought to mitigate these obstacles by forming a critical mass and cross-cultural coalitions. But more importantly, I believe that we were equipped with a unique political grounding, normally absent in community-based organizations or emerging communities, resulting from the transcontinental fusion of political thought and experiences from Korean activists, primarily from the pro-democracy movement (including the Kwangju People's Uprising of 1980), with Korean American activists and thinkers. For community organizations, it is always a challenging task to meet the needs of a population as diverse as Korean Americans. So often, groups have focused on specific sectors such as older new immigrants, seniors, women or adoptees. During the formation of the KRCC, I was one of a handful that spoke English fluently and Korean poorly. In an effort to ensure greater and ongoing participation from second generation Korean Americans and adoptees, we pushed for an inclusive structure and process, both in the operations of the organization, as well as in the programs and issues being addressed. The first and most difficult step towards this goal was ensuring language accessibility for all volunteers through bilingualism. The current mixture of English speaking second generation Korean Americans and adoptees with Korean-speaking first generation and 1.5 generation Korean Americans emphasizes the need for a continuing discourse, in two languages, on a shared vision of community empowerment. Greater generational diversity has also meant that all of the organization's stakeholders must discard images that caricaturized "other" members of our community, from the typical first or second generation to the typical adoptee or Korean American woman. While the process has been painful and frustrating at times, it has enabled us to construct a more "accurate," and broader, definition of the Korean American community and the concept of "Koreanness." Confronting race has also been a sensitive exercise for Korean Americans. On many fronts and throughout recent history, Korean Americans have been pitted against another ethnic minority. Incidents such as the destruction of Korean-owned stores during the Los Angeles civil unrest, or on-going disputes against Latino workers at Korean-owned businesses, feed into the view that Korean Americans are a different kind of minority; they are misunderstood as the exploitative minority. As a child, I remember my father telling me that Koreans are the African Americans of East Asia. And I grew up reading and hearing stories of our community's sad and bitter history, as poor immigrants eking out an existence in America or as Koreans surviving decades of colonialism, poverty and political repression. I believed that Koreans and Africans were spiritual brethren, so as a high school student, it was only natural for me to first become involved in activism through the anti-apartheid movement. How did we come to be pitted against each other? And how can we achieve mutual respect and share in the task of building community? It is this recognition that Korean Americans must begin to address race which propelled KRCC to ensure cross-cultural participation in immigrant rights organizing and advocacy. For example, we have worked with Latinos to draw out the common threads of identity and circumstance as recent or undocumented immigrant, limited English proficiency, low-income, and largely disenfranchised groups. From the summer of 1995/ KRCC also initiated an education series on African American history and the civil rights movement. Weekly study sessions focused on reading specific articles (a scarce few in Korean, and several in English), and viewing the Eyes On the Prize video series. Many young Korean immigrants expressed a closer affiliation with a community that they were alienated from. In most cases, the first African American they came into contact with were the American soldiers stationed in South Korea or their first exposure was through Hollywood movies. Broadly, Korean Americans have also sought to contribute to the modern civil rights movement with our insights and experiences. We have argued for and worked to ensure that language rights and immigrant rights are incorporated into the civil rights agenda and that the debate on voting rights is also considered through an immigrant rights lens. Most importantly, Korean Americans must engage in a race analysis that addresses and is linked to economic poverty in the U.S.
Chicago is a city that has pioneered leading models on organizing. We have sought to build from that tradition and push for a rethinking of traditional models; one that is relevant to the changing political climate as well as the physical and structural changes in our neighborhoods. The achievements of diverse immigrant communities, including Korean Americans, in bringing forth political and social change, have reinforced this need. Fundamental components include forming a multilingual and multi-pronged approach including the combining of strong grassroots activism with effective policy advocacy. In the post 9-11 context, the political landscape has been altered with the scaling back of advances in the immigrant rights arena, and with an increasing backlash against immigrants, religious minorities, Arab Americans, and South Asians. Egregious human rights violations and abuses have been committed against both Americans and foreigners. Families have been separated and individual rights have been trampled on with the deportation and detentions of thousands. Hate crimes have increased at frightening levels of intensity and frequency. As in 1994, the reflex is to protect and defend existing immigrant rights. Yet to do so, would unravel the precious gains made in the past decade. As immigrants and Korean Americans, we must now begin to defend immigrant rights even as we continue to advance them. More dangerous, however, is the militarization of American social values, culture and lifestyle. Individual Americans live in daily fear of a possible terrorist attack. And the Bush administration has manipulated sincere American concerns for peace and security to exercise an aggressive foreign policy that has led to heightened tension in the Asia Pacific region. I believe that while Korean Americans hold differing views on American foreign policy, they are more reluctant to voice them for fear of being labeled anti-American. [Yet, the Bush Administration's own weaving together of domestic and foreign policy concerns through its "War on Terrorism" necessitates the placement of local issues within a global context. Correspondingly, organizations such as KRCC have all the more reason for expanding the scope of their political analysis and work. Beyond the desire to change the environment in which immigrant and civil rights policies are formed, we have sought to cultivate individuals who form an informed constituency. The political awakening of certain sectors in our community such as the Korean American seniors is a marker of our success. The greater challenge now is to carve out a permanent niche for sustained community activism. And in this, Korean Americans can draw from two parallel lines of monumental social change organizing. There is the often untold but rich history of the civil rights movement, and there is Korea's modem struggle for independence and democracy. Both will guide, inspire and root us. These movements teach us that education and organizing begins with the concept of family and a love for the beloved community. Our work for social change cannot be separated from who we are as people. Our beliefs direct how we see the world; as we breathe, we work for change. EunSook Lee is a founding board member of the Korean American Resource & Cultural Center of Chicago, former Associate Director and West Coast Director of the National Korean American Service & Education Consortium (1996-2000), and the former Program Coordinator and later Executive Director of Korean American Women In Need (1994-1996, 2001-2003). Other related activities such as Census 2000 and redistricting were also introducted during this period. ↑ According to the 1990 Census, 24.1% of Korean American families in Chicago lived below the federal poverty line. ↑ While Korean immigrants may have been born in either the Democratic Peoples Republic of Korea (DPRK) or the Republic of Korea (ROK), the overwhelming majority arrived to the United States as ROK citizens. For this reason, the paper will focus on impact of the ROK's political, economic and social situation on the Korean American community. ↑ A cash benefit program for low-income disabled or elderly Americans. ↑ According to the 1996 Current Population Survey, which was published by the U.S. Bureau of Census, the poverty rate of Korean Americans 65 years and older was 22.4%. This rate was the highest from among the following five Asian Pacific American populations: Korean, Chinese, Japanese, Vietnamese and Filipino. ↑ In 1989, YKU Chicago member Tae Hoon Park was the first South Korean national arrested for violating the NSL through overseas activities. ↑ A community forum featuring representative from the Latino, Chinese American and Korean American communities drew 300 people to North Park College in 1995. ↑ Given that the Korean American adult population is predominantly limited English proficient, personal phone calls were a difficult advocacy action to undertake. ↑ Korean Americans also participated in protest activities including rallies and a one-week hunger strike in Los Angeles. ↑ The Asian American Institute coordinated this project with KRCC and the Chinese American Service League. ↑ Fix '96 refers to the restoring the wrongs of the 1996 welfare and immigration laws. ↑ The seniors funded their trip by holding fundraisers including a one-day coffee house. ↑ We have seen a replication of our organizing tactics and model such as the bringing together of Asian Pacific American immigrants for a national lobby day or a grassroots funded ad campaign to the very formation of the multi-ethnic coalition, the Coalition for African, Asian, European and Latino immigrants of Illinois (CAAELII). ↑ The newly formed Department of Homeland Security (a merger of 22 agencies, including the INS) has created the largest standing armed forces in the country with 70,000 armed agents for border and interior immigration enforcement. ↑ South Korea is one of the few nations in Asia that achieved democracy through popular struggle.